Red's Eats roadside restaurant in Wiscasset, Maine. From American comfort cuisine and ethnic bistros to French brasseries and world-famous lobster shacks, the restaurant culture in Maine is as diverse as the weather in New England. Maine is both a maritime and agricultural state, and it is this fusion of land and sea that has created a melting pot of different styles, flavors, textures, settings and dining experiences. While there are certain criteria and standards in which to judge food, criticism, for the most part, is a subjective art. It is doubtful that the locals and tourists will ever agree on a list of Maine’s Top 5 Lobster Shacks, nor will seasoned foodies who scour the scene for innovative trends, mismatched fusion and the latest molecular gastronomic sculptures (thank you, Ferran Adria) ever agree on which Michelin star restaurant is more deserving than the next. Food is more than Top 5 Lists and spheres of luminous solar plasma. It is about the journey that took you to the food and the company you are with. It is about the crisp, pine and salt scrubbed smell of Maine’s coastline, and the way the afternoon sun dapples the Atlantic as you snap crab legs at a seaside shack. The best restaurants and most memorable dining experiences are often discovered by accident. One day you and your wife walk into a ramshackle lobster pound because nothing else on the coast is open in February, and for the rest of your life you are heading back to the pound every time you are in Maine because it has the best cornmeal encrusted haddock sandwich on the eastern seaboard. A sense of adventure, a hint of luck and a willingness to try something new are the golden rules to discovering extraordinary restaurants. From greater Portland and Casco Bay to Kennebec, Midcoast and Downeast, Maine has all sorts of places to eat. Even if you enjoy the pursuit of a good restaurant, it is always good to have a place to start. Think of the following as points of reference on your map of Maine’s treasured lobster shacks, upscale eateries and hidden gems. Any deviation from the path is strongly recommended. 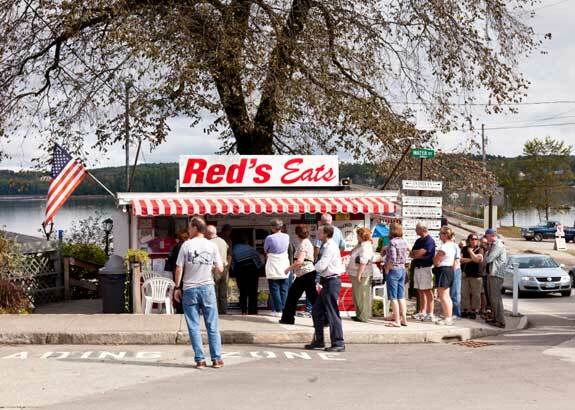 Red’s Eats, located in Wiscasset, near Boothbay, has the best lobster roll in the state. Operating since 1938, this lobster shack has been featured on numerous Travel Channel programs, and the line of people waiting in the summertime can extend down the block. Why all the fuss? Red’s heaps a full pound of tender lobster meat on its toasted buns. Located on Bailey Island, in Harpswell, Cook’s Lobster House has been named the best seafood restaurant in Maine by Yankee Magazine since 1995. Surrounded by the Atlantic, Cook’s is as well known for its stunning coastal setting and romantic view of Bailey Island as it is its fresh New England seafood. However, when Cook’s says fresh, it is not just a figure of speech. All of its fish, shrimp and shellfish are purchased at the local wharf. If you are shopping at the Kittery outlet stores in southern Maine, Chauncey Creek Lobster Pier, in Kittery Point, will not disappoint. Sit at one of the brightly colored picnic tables and enjoy the picturesque view of Pepperrell Cove. Chauncey’s has been serving lobster to southern Maine for over forty years. At Michelle’s Fine Dining, Chef Roger Potvin creates traditional French cuisine with a hint of Yankee flair. Nestled in the Ivory Manor, in downtown Bar Harbor, Michelle’s Fine Dining is a Four Diamond restaurant that specializes in dishes like seafood bouillabaisse, Provencal Salmon and Orange French Ale Striped Bass. If you are in the mood for a taste of the City of Light, then make a reservation at Michelle’s. Clay Hill Farm, in Cape Neddick, recently won the DiRoNA, an award given to the best fine dining establishments in the northeast. Clay Hill emphasizes local, fresh and seasonal ingredients. From seared duck breast and Blue crab and mushroom pasta to lemon haddock and Prime Rib Au Jus, the menu and preparation methods change with the seasons. When it comes to food, Portland is Maine’s newly discovered El Dorado. There are more award winning eateries in this small port town than in the city of Boston. Heathman Restaurant and Bar was one of the first places to solidify Portland’s place on the culinary map. Chef Philippe Boulot not only won the James Beard Award in 2001, but Heathman Restaurant also received a Best Award of Excellence in 2008 from Wine Spectator. If you follow Maine’s gourmand trail, you will discover that its fine dinning culture began here.